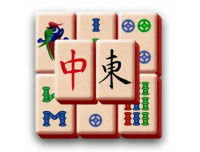 Mahjong is a board game for 2-4 players. Unlike other Chinese board and dice games that is not Mahjong ancient, but only about 150 years old. The oldest written and archaeological finds indicate that the game originated in China first in the 1870s and it is likely that it was invented by the two craft brothers in the city of Ningpo in Chekianprovinsen, a city famous for its ivory-carving. Some oral sources claim, however, that the game for many centuries could only be played by the imperial court. The game would then have been of the highest aristocracy before it was permitted for ordinary people. 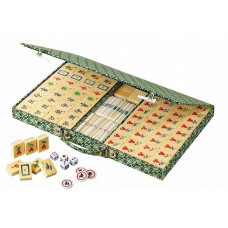 Mahjong set made of bamboo, AN 3162 / Mah Jongg set with Arabian signs, in decorative Case with handle. Pieces made of bamboo. 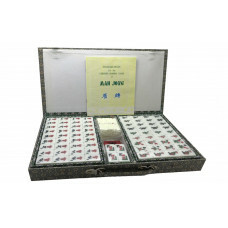 See "Specification" for detai..
Mahjong set made of acrylic, AN 3166 / Mah Jongg set with Arabian signs, in wooden box with clasps, in rootwood design, red-brown stained. 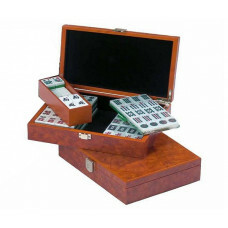 Pieces made of acryl..
Mahjong set made of urea, 720400 / Mah Jongg complete set in decorative Cloth Case with handle. Pieces made of urea with Arabian signs. 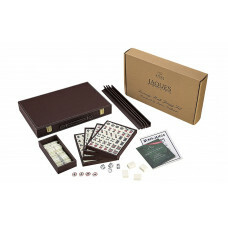 See "Specification" ..
Mahjong set made of urea, 720399 / Mah Jongg complete set in Vinyl Case with, cassette design. Pieces made of urea with Arabian signs. 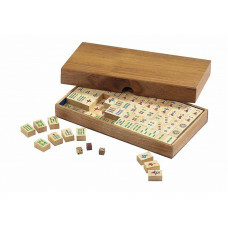 See "Specification" f..
Mahjong set made of samena-wood, AN 6322 / Mah Jongg set in nice wooden box natural stained. Pieces made of samena-wood with Chinese signs. See "Specificati..
Mahjong set luxury Club, AN 1795 / Handmade cabinet in decorative Case with handle. Pieces made of acrylic with arabian signs. 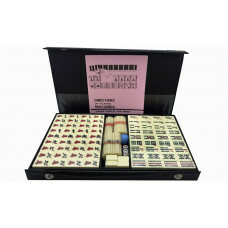 This mahjong set is packed with ..